As the afternoon began winding down yesterday and people began heading back to their campsites to prepare for the nightly headliners, the wild bluegrass group that is Mountain Sprout took the smaller Revival stage (just across the field from our American Songwriter booth). After overhearing a song in the distance and witnessing large groups rushing toward the stage, I decided I should wander over and check out what the act was all about. Arriving at the stage, I was pleasantly surprised to find the men of Mountain Sprout appropriately bearing unkempt beards and tattered jeans, just as one would expect from such insane and fantastic fiddle shredding and banjo picking. As the set went on I was amused to hear the band wail through one after another weed-smoking, beer drinking anthems such as, “Nothing Matters if You Don’t Mind,” “Swear I’ll Never Drink Again,” and “Stinkin’ Like A Turkey Buzzard.” Although Mountain Sprout’s songwriting capabilities are slightly lacking for my taste, their musicianship and energy didn’t cease to amaze me throughout their entire set. As the band got more and more vulgar with their songs, the musicianship only seemed to get better, never once giving the audience a chance to stop dancing and catch their breath. 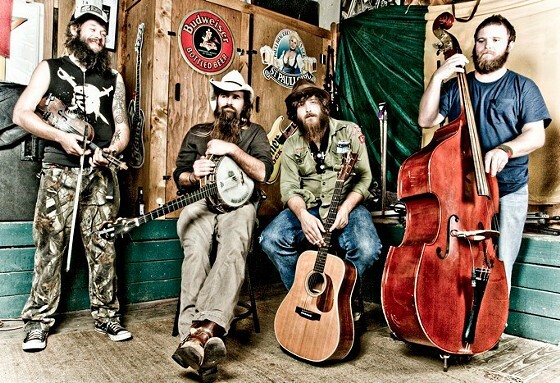 As self-proclaimed “hillbilly” musicians, Mountain Sprout has definitively captured the essence of hillbillies and hillbilly music. Although I’m not sure how far outside of Arkansas their songwriting will take them, their live show would definitely get me off my couch in Nashville if they were ever to stop by.